Are you arriving internationally or from out of town? Are you staying in Auckland before or after coming to Waiheke? Then let Mudbrick look after you in Auckland as well! We have just released this adorable inner city cottage so close to all the things you need to be close to, in Auckland. 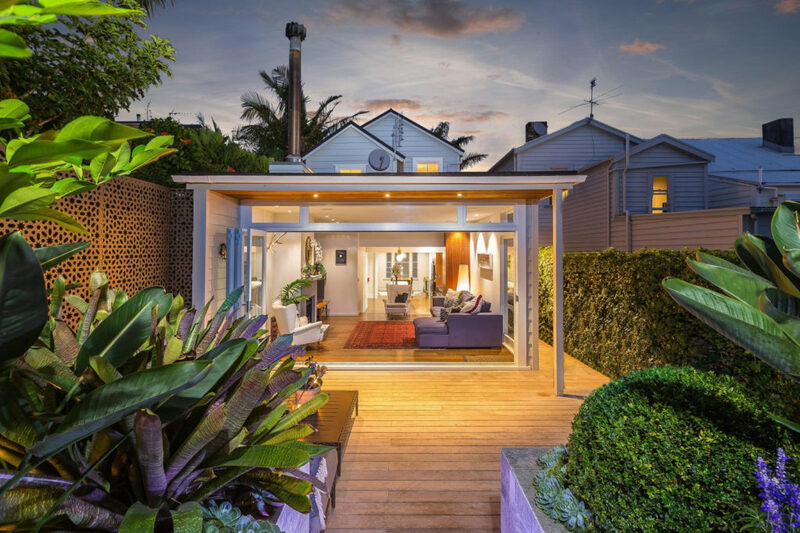 This cottage is in the vibrant neighbourhood of Ponsonby. If your’e an international traveller reading this, let me describe the area of Ponsonby to you. If Auckland was a mini New York, then Ponsonby is Williamsburg. If that doesn’t resound with you, let me explain. Ponsonby is non-generic territory, sans chain stores. An inner city suburb, a creative hub that people actually live in, closest to the CBD. It is a vibrant mix of creative cafes, bars, designer clothes stores, designer furniture stores…pretty much all things designer. We are not talking Gucci or Prada here, we are talking New Zealand clothes designers, vintage clothes stores, local art galleries. My cottage is in the ideal location, because it is walking distance to Ponsonby Road, and “Ponsonby Central” as it is known, which is a fantastic creative clutch of cafes, restaurants and stores – a place where, if I were travelling, I would be delighted to happen upon. You can walk up Ponsonby Road and never tire of the sights and stimulations that this vibrant Road has to offer. It has divine spas, upmarket yoga studios, fantastic bars – cool cafe’s, fancy produce stores, and markets at weekends. You’ll be able to sink into soft, luxurious linens and sleep peacefully amongst a tree-lined street of heritage cottages, which will give you a truely New Zealand experience. The cottage is a 2km walk to the Britomart, viaduct, downtown area of Auckland which is also fun and a great place to walk around. Its not the ideal location to stay however as it is very noisy. Trucks with bottles, rowdy party-goers and screeching giggly girls will keep you awake until the large hours of the morning, which is why as a local, I knew to buy in Ponsonby where you have the very best of both worlds. It’s so close to everything that your own transport is hardly necessary, but if you do have a car, it has 2 carparking spaces. Car parking is very hard to find in inner city Auckland, with alot of residents having to park on the street. If you decide to hire a car for the rest of your travels, rest assured it too has somewhere to stay. Your friends can join in – the cottage sleeps 6 guests. Three bedrooms and the luxury of 2 bathrooms, a beautiful sunny patio area and a very highly specified designer kitchen. Kitchen (Dishwasher, Fridge, Oven, all cutlery and crockery supplied). Toddler friendly – but please note there are stairs which are not gated. A 2 night minimum is required. This price is all inclusive of premium Linen, towels, wifi, Govt Tax and cleaning upon departure. A $600 bond is payable at the time of the booking. This will be refunded once the house has been checked upon departure. Take an Uber or a Taxi, easy and fast from the airport. If you would like us to arrange a Taxi to collect you from the airport please ask! One car is kept at the property and there is one extra space. If you’re bringing two vehicles please let us know. That way, if two cars are coming we can remove it for your stay. Thank you. “If you’re looking to book a place in Auckland, LITERALLY stop looking and book Robyn’s place in Ponsonby right now. First of all, the location is an absolute “10” just a short walk from the best street in Auckland for cafes, nightlife, etc. The place itself is an incredibly charming Victorian town-house with modern interiors and an awesome back patio — the photos on the AirBnB profile are stunning, but having stayed there, it somehow looks even better in person. Robyn also went out of her way to attend to the details — placing a bottle of bubbles in the fridge from her vineyard on Waiheke Island (go there btw), leaving us a portocot as we were traveling with our baby, and shampoos and a hair dryer which made traveling that much easier. Stay and dine packages : Treat yourself to 4 nights with us for the price of 3!